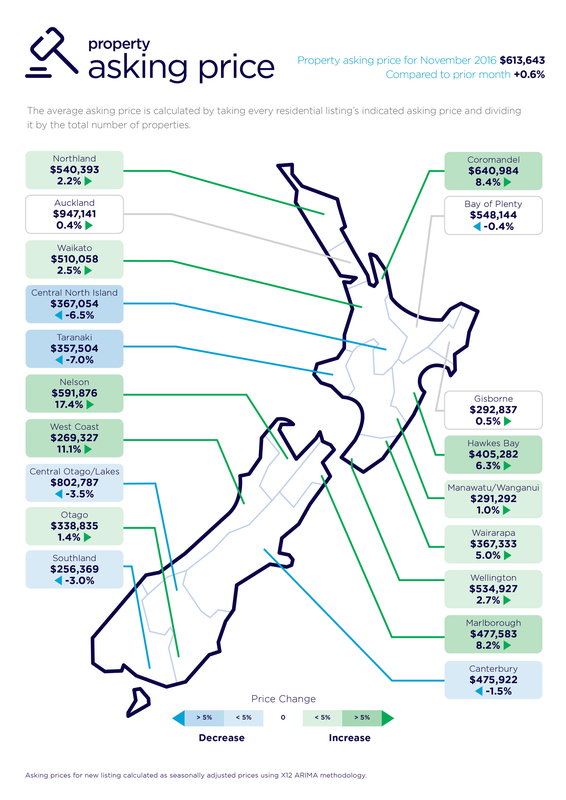 Download the New Zealand Property Report in full here. The New Zealand housing market has settled into a typical pre-Christmas pattern, as Kiwis turn their focus to the upcoming holiday period. Real-time market statistics from realestate.co.nz for the past three months (ending 30 November) show a comparative cooling in demand across the main centres – most noticeably Auckland. Demand is measured by the average number of views per listing for September, October and November 2016 which are then compared to the same period in 2015. “Auckland was the only region across the country where demand is down on the same period last year,” says realestate.co.nz CEO Brendon Skipper. Demand in the region dropped 8.1 per cent, compared to the same time last year. The average asking price in Auckland went up just 0.4 per cent in November, compared to the previous month. Despite this slower rate of growth, asking prices in the region hit another record high of $947,141. “A slowing rate of growth and a decrease in demand means properties in Auckland are sitting on the market for longer. In turn, this means more options for buyers,” he says. While demand is up in all other regions, there appears to be a current focus on regions renowned for lifestyle options. The Wairarapa, Marlborough and the Coromandel regions feature strongly. In the smaller regions, Gisborne and the West Coast are also attracting interest. “As we prepare to head into the holiday period, it appears an increasing number of Kiwis are considering investing in a bach or holiday home,” says Brendon. “But Kiwis who were looking to buy a holiday pad in the Coromandel in November may have struggled to find one, as we recorded a drop in new listings in this region,” he says. The region registered a significant drop in new listings in November, down 39 per cent compared to the same time last year. Coromandel, Marlborough and Nelson all recorded sizeable spikes in the average asking price in November, when compared to the previous month (up 8.4 per cent, 8.2 per cent and 17.4 per cent respectively). The Manawatu/Wanganui region continues to be in hot demand. In November, the region recorded New Zealand’s highest percentage increase of new property listings compared to the same month last year. The 17.1 per cent jump in new listings was not at the expense of price. The region saw the average asking price hit $291,292. “Remarkably, properties are turning over more quickly in this region compared to Auckland,” says Brendon. If there were no new properties listed in the Manawatu/Wanganui region, theoretically there would be no properties left for sale within 13 weeks. 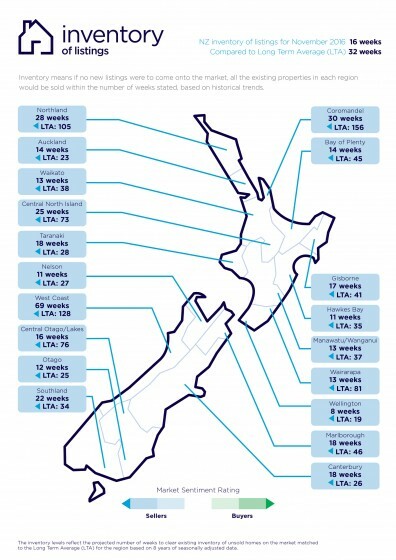 In Auckland, it would take 14 weeks to clear all current property listings. Has the shine gone off the Auckland property market?